Civil society actors took a stand at the Civil Society Forum in Paris on 3-4 July 2016. At a moment of existential crisis for Europe, we believe that civil society need to be at the core of a renewed effort and vision to face common challenges. The Civil Society Forum in Paris was the latest conference in a series that started from a governmental initiative as the so called “Berlin Process“. Civil society actors took on this initiative by heads of states to connect their own proposals and make their voices heard. We would like to congratulate the governments for signing up to the COP21 engagements and to the EU Roadmap 2020. Addressing climate change and environment issues provides powerful leverage for sustainable development and democracy in the Western Balkans region. We would like to encourage the governments to support the implementation of the Western Balkans sustainability charter. RYCO should include specific programs dealing with the past issues of WB countries · Regular evaluation of RYCO should be done by civil society actors. The Western Balkans format should include other member states to solve bilateral issues (including Bulgaria, Romania and Greece, for example). The EU and Western Balkan countries should facilitate safe mobility, and safe, regular and legal channels for migration to Europe instead of building fences or closing borders. The lack of commitment of EU leaders to enlargement is reducing the EU’s leverage in the region. EU leaders need to express themselves clearly in favour of the enlargement. Democratic resilience is increasingly guaranteed by grassroots and social movements in the Western Balkans region and the EU should look for new alliances to support those emancipatory alliances standing at the frontier of protecting democracy. Other Civil Society Fora were held in Vienna in August 2015, and in Novi Sad and Belgrade in May 2016. 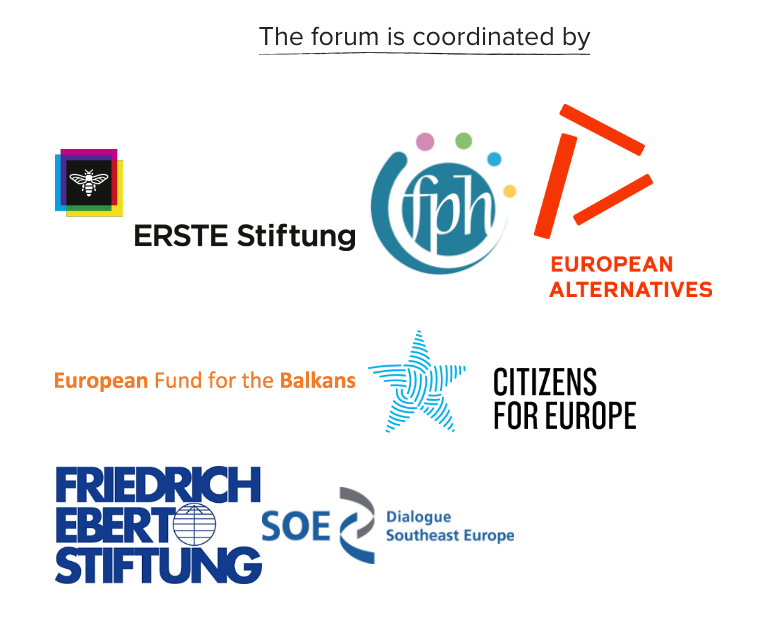 This conference series brings together activists and representatives of civil society from the European Union and the Western Balkans to formulate recommendations for the future of the European project, and integration of the Western Balkans countries.